Our cut to size American Ash timber products (also called sawn to size) are literally sawn down to your chosen measurements and come straight off the saw with no machining performed to the edges, unlike our planed products. Our cut to size timber is untreated and is most commonly dried in kilns to remove moisture content. Sawn American Ash is ideal if you don’t have the facility to cut timber down in-house. American Ash is ideal for furniture and cabinet making, turnery, impact tool handles, sports equipment, panelling and even solid-body electric guitars. It is also suitable for steam bending, but should not be exposed to the elements. 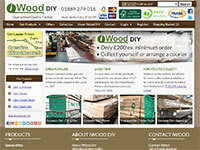 At iWood Timber Merchants we have built our reputation on supplying quality timber, ensuring you have the greatest percentage of usable American Ash timber possible from your order.